Royal Mail’s latest Post & Go stamps, issued today, feature creatures from UK lakes. Designed by Kate Stephens and created by lino-cut artist Chris Wormell, the stamps feature The European Eel, Crucian Carp, Arctic Char, Common Toad, Perch and Caddis Fly Larva. These six species are found across the UK with four of the creatures considered rare or under threat. This issue follows Ponds as the second of three Post & Go sets to be issued in 2013 – all on the subject of the UK’s freshwater life. The national charity Pond Conservation has advised on all the stamp sets. The charity works in all freshwater environments and runs the successful annual Big Pond Dip, where the public is invited to monitor local ponds for life. Pond Conservation’s Big Pond Dip is currently running: for more information visit; www.pondconservation.org.uk/bigponddip. Perch – 1st class stamp from the Freshwater Life: Lakes Post & Go Stamps, issued 25th June 2013. European Eel – 1st class stamp from the Freshwater Life: Lakes Post & Go Stamps, issued 25th June 2013. Crucian Carp – 1st class stamp from the Freshwater Life: Lakes Post & Go Stamps, issued 25th June 2013. Caddis Fly Larva – 1st class stamp from the Freshwater Life: Lakes Post & Go Stamps, issued 25th June 2013. Arctic Char – 1st class stamp from the Freshwater Life: Lakes Post & Go Stamps, issued 25th June 2013. Common Toad – 1st class stamp from the Freshwater Life: Lakes Post & Go Stamps, issued 25th June 2013. The Freshwater Life Lakes stamps are available from Post & Go terminals in 146 Post Office branches, at www.royalmail.com/postandgo and by phone on 08457 641 641. 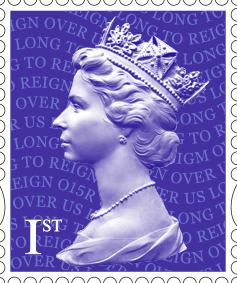 We care for a unique and precious collection of stamps and philatelic material which includes registration sheets, essays (trial stamps) and proofs of all stages of British stamp production from 1840 to the present day, and all artwork, adopted and unadopted, for all issued and some un-issued British stamps from 1924. Material is constantly added to the collections as we receive around 500 pieces of stamp artwork from Royal Mail every year. A lot of this material has already been available online, through our website, online catalogue and the project to digitise the R M Phillips Collection, but we are always looking for new ways to make our collections accessible. Would you like our stamps on your mobile device? Fill in the survey and give us your views. Recently a group of students from the Worcester Polytechnic Institute in Massachusetts have been working with us on a research project to look at new ways to make our philatelic collections more accessible. 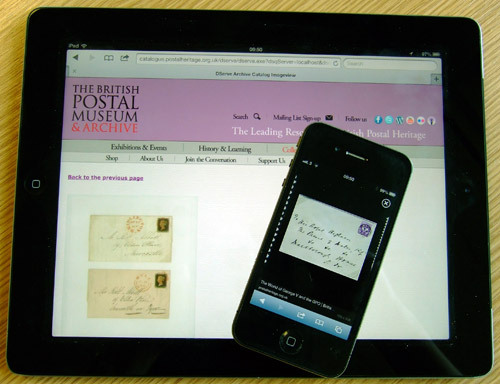 The students have put together a short online survey to determine interest among stamp enthusiasts in a mobile or tablet app displaying our collection. If you have any interest in stamps, either as a collector, a philatelist, or a postal or design enthusiast, then we would like to hear your views on this project. Click here to complete the survey. 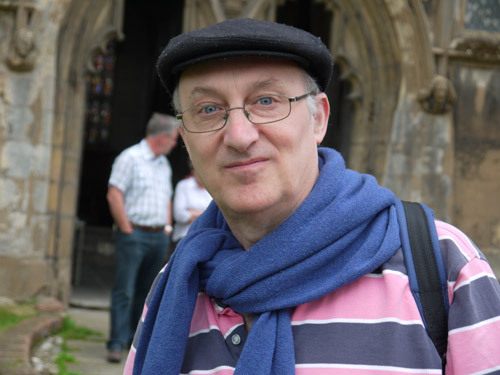 On Thursday 21 February Chris West, author of First Class – a History of Britain in 36 Postage Stamps, will give a talk at the BPMA in London. 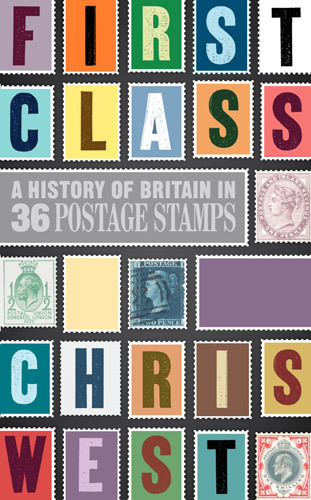 Chris’s book explores British history as illustrated by our most expressive, quirky, beautiful and sometimes baffling stamps. Drawing on his book, Chris will tell the story of how the Penny Lilac united a nation in 1881 and examine the controversy surrounding the Edward VIII stamp of 1936. 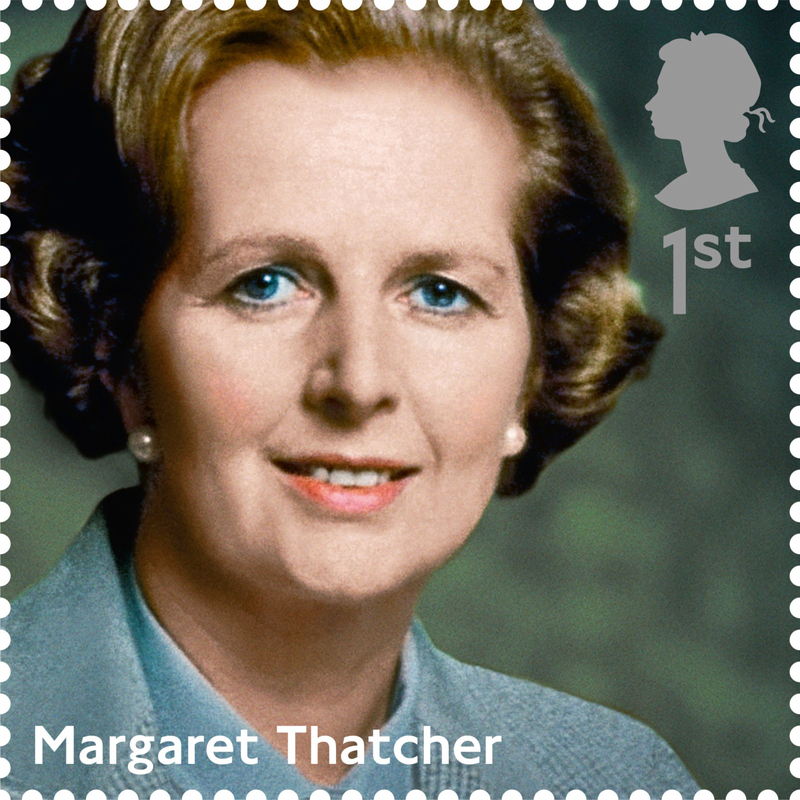 More recent history such as the punk era and the Prime Ministership of Margaret Thatcher will also be explored. 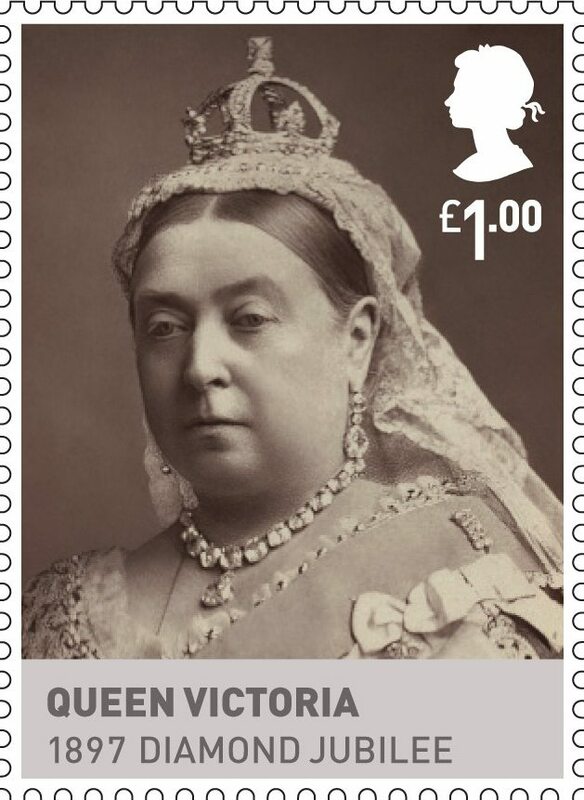 Tickets to the talk First Class: A History of Britain Told Through 36 Postage Stamps can be purchased through our website at the cost of £3 per head, £2.50 for concessions. Read Chris West’s blog A Cup of Tea and its consequences, or purchase First Class – a History of Britain in 36 Postage Stamps through our online shop. Having recently catalogued all Great Britain Queen Elizabeth II pre-decimal commemorative registration sheets of stamps, it dawned on me how much the ‘First Flight of Concorde’ stamps of 1969 stood out; both in terms of their slick design and ultimately the subject that they embodied. After all, this ‘Supersonic’ airliner, of Anglo-French origin is as an aviation and engineering icon. During the late 1950’s, The British, French, Soviets and Americans were in competition, as each nation industriously worked towards developing a form of commercial civilian supersonic transport. It was the British and French however (both funded by their respective governments) who jetted ahead in this particular pursuit. Subsequently they developed designs called the ‘Type 233’ and ‘Super-Caravelle’ respectively, which ultimately saw them leading the commercial aircraft market at the time, which until then had been dominated so ardently by the United States. 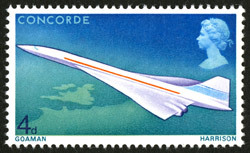 First Flight of Concorde – 4d value, designed by M. and S. Goaman, issued 3 March 1967. 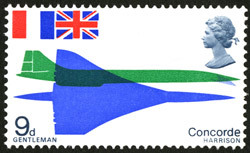 First Flight of Concorde – 9d value, designed by David Gentleman, issued 3 March 1967. 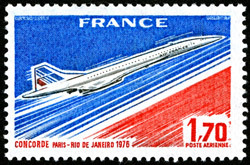 First Flight of Concorde – 1s6d value, designed by David Gentleman, issued 3 March 1967. Due to the impending costs which ensued with the production costs however, the British and French combined forces, forming an international treaty (rather than an agreement on commercial terms) in the early 1960’s, where their newly formed British Aircraft Corporation (BAC) and Aérospatiale companies merged, on what famously became the ‘Concorde’ project. It was this partnership which proved triumphant, as the first Concorde prototype was presented in 1967. Concorde’s maiden flight on the 2nd March 1969 was heralded as ‘faultless’. 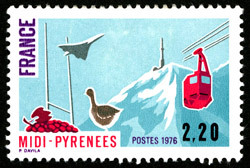 The aircraft took off from Toulouse and reached 10,000ft. 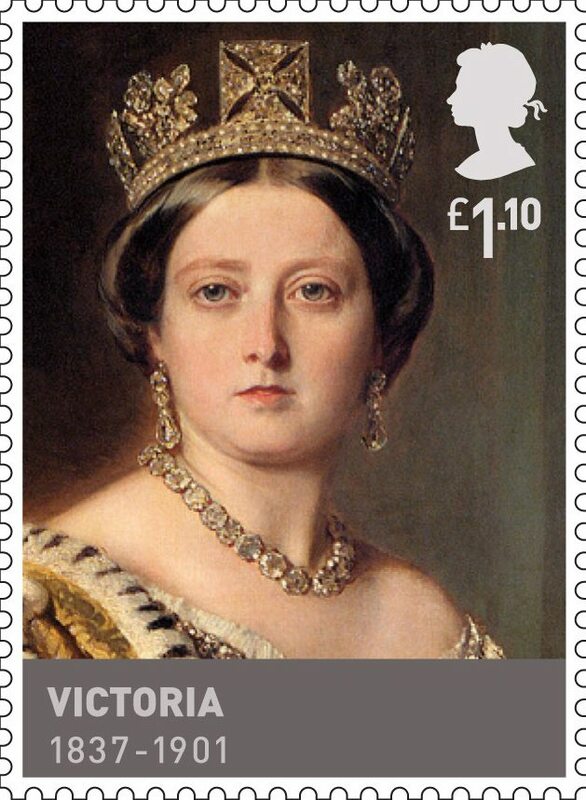 The following day three postage stamps were issued in Britain, with one design (4d) by M. and S. Goaman and the other two (9d and 1s 6d) designed by the prolific and imperious David Gentleman. Looking at Gentleman’s designs specifically, the simple but bold minimal style sits well within current trends in graphic design, thus evoking a timeless appeal. Printed by Harrison and Sons on chalk-surfaced paper, with two phosphor bands, the stamps pay homage to this British design great. Although a success, Concorde’s maiden flight never actually reached above 300mph, thus failing to achieve its potential ‘supersonic’ status. Concorde’s first supersonic flight (for those inquisitive amongst you) came on the 1st October 1969 where it achieved closer to the 1,300mph it was capable of. Concorde’s first commercial flights took place on 21st January 1976 – Air France flew from Paris to Rio and British Airways’ Concorde flew from London Heathrow to Bahrain. Concorde’s final flight was on 26th November 2003, following the tragic aftermath of Concorde’s only crash on 25th July 2000, and the global economic downfall of the subsequent years. Evidently, Concorde was voted the winner in the ‘Great British Design Quest’ competition of 2006. Organised by BBC2’s The Culture Show and London’s Design Museum, the Concorde design beat competition from 25 other British design classics – including Mary Quant’s mini skirt, the Routemaster Bus and Harry Beck’s 1931 London Underground Map design (runner-up). This news came as a delight to Concorde fans, notably Tony Benn – the former Postmaster General – who himself has been so prominent throughout British Postal History. Benn was the Aviation Minister responsible for giving Concorde the go-ahead in the first place. 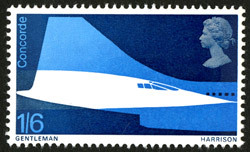 The 2009 stamp issue ‘British Design Classics’ features ten iconic designs, including Concorde and the other aforementioned ‘design classics’, plus others – thus tying in nicely with the British Design Classic theme of which Concorde so famously championed. 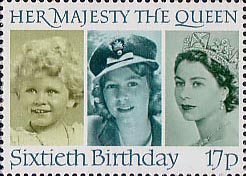 The full series of Queen Elizabeth II pre-decimal commemorative registration sheets are due to be made available via the BPMA’s online catalogue, each with a full catalogue description and a digitised section of each sheet, including of course the 1969 Concorde stamps. 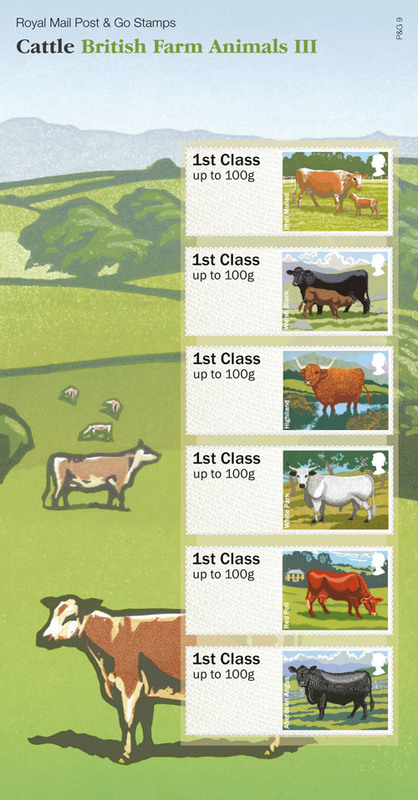 Royal Mail rounds off its British Farm Animals series of Post & Go stamps with its third and final issue featuring six examples of cattle breeds found in the British Isles. The Post & Go Cattle stamps issued today include the extremely endangered Irish Moiled, one of Britain’s oldest the White Park, and one world’s best known breeds, the Aberdeen Angus. The Aberdeen Angus also has royal connections: HRH Prince Charles is the patron of the Aberdeen Angus Cattle Society and has a successful herd at Highgrove. 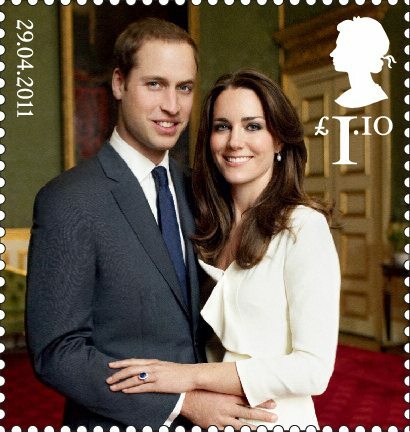 The other cattle featured on the stamps are the Welsh Black, Highland and Red Poll. As with all previous Post & Go pictorial stamps, Royal Mail has commissioned Kate Stephens to oversee the designs, which are illustrated by wildlife artist Robert Gillmor. The British Farm Animals series began with sheep in February, followed by pigs in April. The Cattle Post & Go pictorial stamps will be available from Post & Go terminals in 146 Post Office branches. 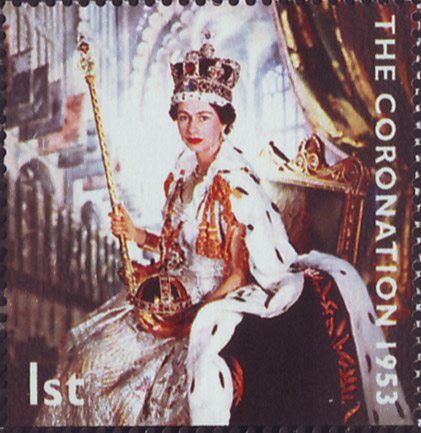 The initial design used for the self-adhesive stamps, which are overprinted with the postage on demand, featured the profile of Her Majesty the Queen created by Arnold Machin and used on UK definitive stamps. 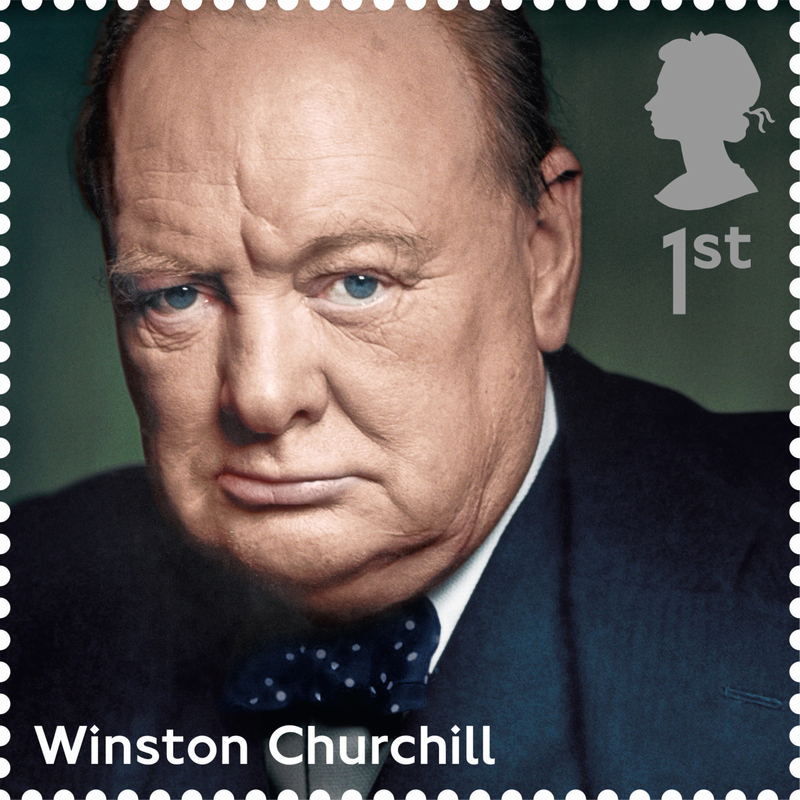 Pictorial versions of these new kinds of stamps were introduced in September 2010 with the first in the Birds of Britain series. Post & Go terminals allow customers to weigh their letters and packets, pay for and print postage stamps and labels without the need to visit the counter. The first Post & Go machine was trialled in The Galleries Post Office in Bristol in 2008. Since 2008 over 220 terminals have been installed in 146 branches. Two First Day of Issue handstamps are available to accompany this issue. 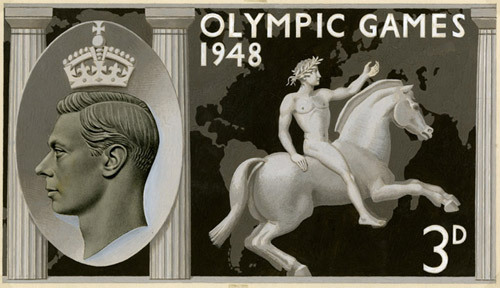 From 25th July to 9th September 2012, the British Library is running the exhibition Olympex 2012: Collecting the Olympic Games, telling the story of the past and present of the Olympic Games through the medium of postage stamps and related memorabilia. As well as contributing to the exhibition the BPMA has also been involved in the accompanying book The London 1948 Games – A Collectors Guide. This new publication by Bob Wilcock, of the Society of Olympic Collectors, gives us a detailed postal background of the 1948 Olympic Games. 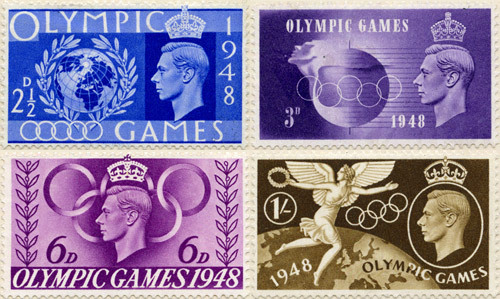 As the stamp issuing policy at the time was very conservative, not all serious proposals resulted in commemorative stamps – but one event could not be ignored, and that was the holding of the Games of the 14th Olympiad in London and the south of England. 14 designers submitted designs, and from these the Council chose work by G. Knipe of Harrison & Sons, S. D. Scott of Waterlows, Edmund Dulac, Percy Metcalfe and Abram Games. Before these were shown to the King, the Postmaster General felt another option should be offered, and recommended a design by John Armstrong. 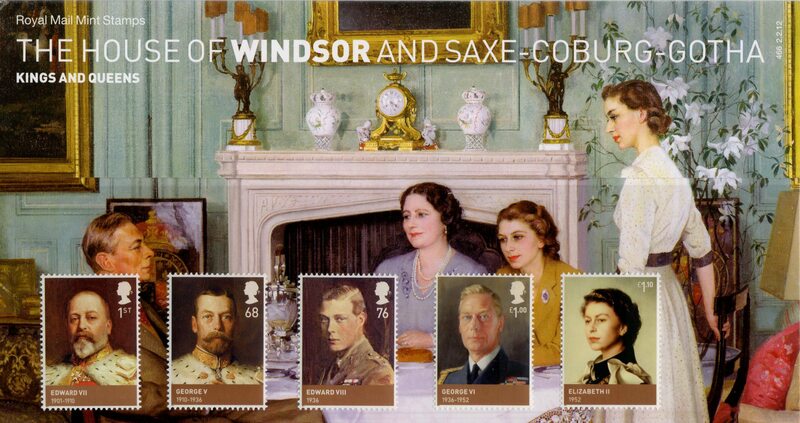 The book contains images of all submitted designs as well as the issued stamps. With hundreds of colour illustrations, the books also features first day covers, postmarks, postal stationery, cigarette cards and other ephemera – a must-read for Olympic collectors. 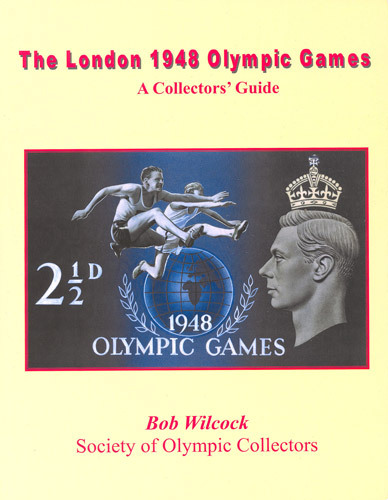 The London 1948 Olympic Games – A Collectors’ Guide by Bob Wilcock is now available from the BPMA online shop.